1. Peel the boiled potatoes and slice them. Cut the beef and sausage into thin slices. 2. Finely dice the onion. Heat the butter (or lard) in a pan and lightly fry the onion. 3. Add the meats to the pot with the onions and fry. Season the meat with salt and pepper when it’s cooked through. Remove from heat. 4. In a separate pan, heat oil and fry the potato slices until they are crispy. Season with salt, pepper, and marjoram. 5. 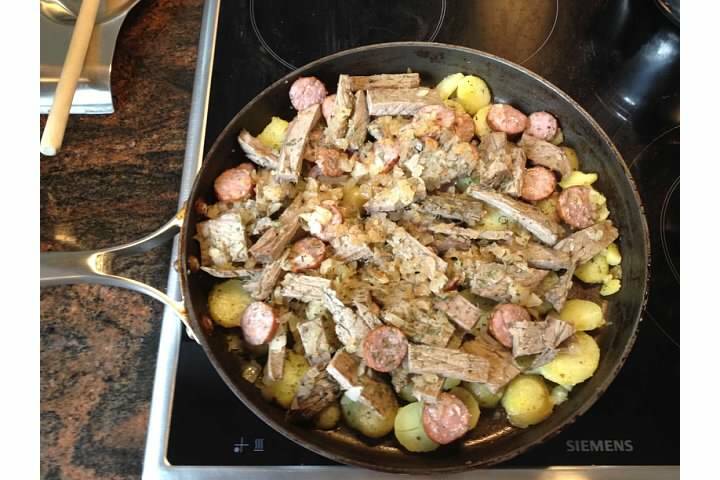 Add the cooked meat to the pot with the potatoes and sprinkle everything with parsley and caraway. 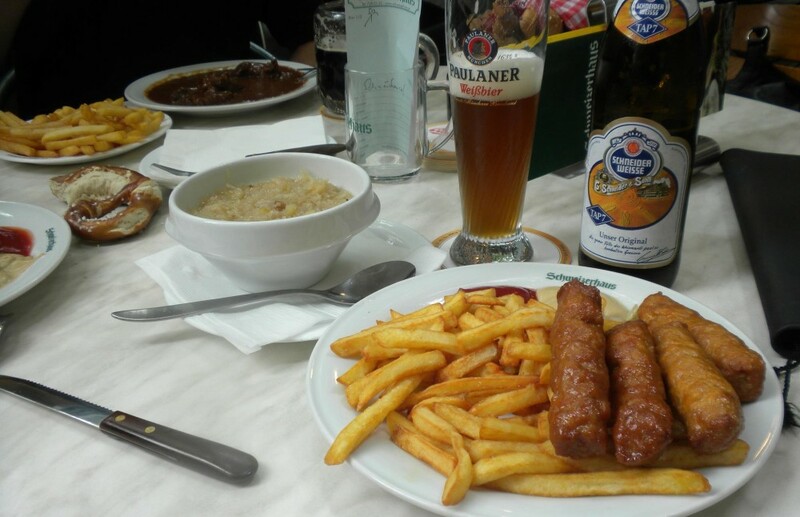 Tafelspitz was reportedly one of Emperor Franz Josef’s favorite meals, and according to Wikipedia it is also considered Austria’s national dish. 1. Fill a large pot with about 5 liters (ca. 21 cups) of cold water. Wash the bones and add to the pot. 2. Remove any tendons and skin from the beef, but leave the fat on. Add it to the pot, along with the bay leaves, peppercorns, and juniper berries. 3. Heat the pot on low heat and get it to just below the boiling point. Simmer the beef at this temperature for 2-2 1/2 hours, repeatedly skimming the foam from the surface. 4. About one hour before the beef is done simmering, cut the unpeeled onion and fry it in a pan until the cut surfaces are dark brown. Cut the other vegetables into large cubes, and add them and the fried onion into the pot with the meat. 5. When the meat is done boiling, lift out the meat and strain the broth. (To test meat for doneness, stick it with a fork; the fork should lightly press into the meat.) Return the soup to the strained broth and let the meat rest for a bit. 6. Once the meat has rested, cut it into slices and arrange it on warm plate. Pour some of the broth from the pan over it. 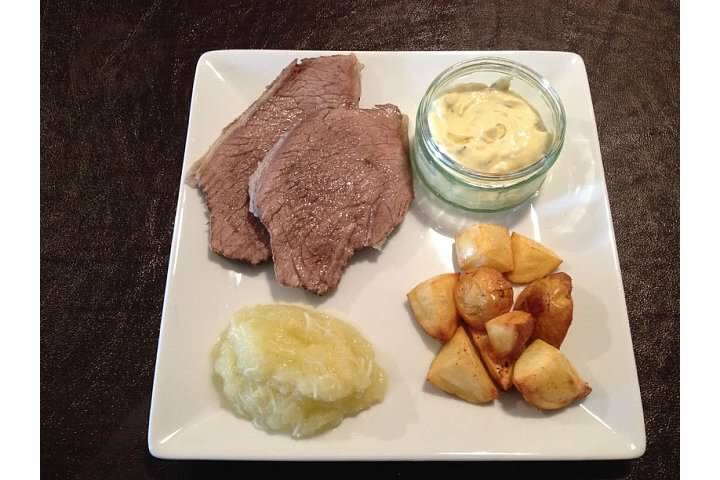 Traditionally served with crispy roast potatoes, schnittlauchsauce, and apfelkren. Reserve 300 grams if using Tafelspitz for Tafelspitzgroestl (recipe to follow). 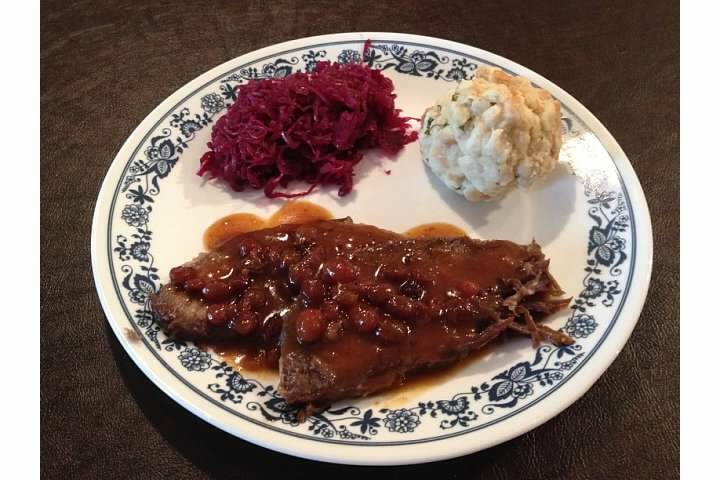 *The cut of meat the Austrians use for tafelspitz is called “tri-tip” in the U.S. According to one of my Austrian cookbooks, an upper rump cut can be used. I don’t know whether “tri-tip” and “upper rump” are the same, but there you have it. 1. Combine the vinegar, water, cloves, mustard seeds, peppercorns, and bay leaves in a large pot. Add the onions and soup vegetables to the pot, and bring everything to a boil. Boil for 5 minutes. Let cool. 2. Wash the beef and pat dry. Put the meat in a glass or ceramic bowl and pour the cooled broth over the beef. Cover with cling film and let stand in the refrigerator for 3 days, turning the meat after a day and a half. 3. Remove the meat from the bowl. Press the marinade through a sieve and collect the strained juices for the sauce. Discard the vegetables, etc. left behind in the sieve. 4. Heat a large, heavy pot and melt the fat. Brown the meat on all sides. 5. Pour the marinade over the meat and stir until it combines with pot juices to become a dark sauce. 6. Reduce the heat to low. Gradually add the currant jelly, apple butter, raisins, and gingerbread. If the sauce is too thin, add liquid cream and flour. 7. Transfer beef and sauce to a roasting pan and roast in the oven for two hours.